The writer has apologised after allegations he copied content from a number of sources in his international affairs column. 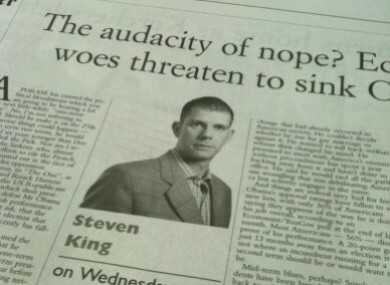 Steven King's column from last Wednesday. THE IRISH EXAMINER says that its weekly international affairs columnist Steven King has resigned from the paper. The resignation follows allegations that King plagiarised passages for his column from a number of sources including blogger Brendan O’Neill of Spiked, and from Salon.com and Commentary Magazine. The allegations were made by journalist Brian Whelan, who previously uncovered evidence of plagiarism in the work of London Independent columnist Johnn Hari. Hari is currently on unpaid leave and is undertaking a journalism training course. The Examiner’s editor Tim Vaughan said in a tweet from the paper’s account last week that “this is a very serious issue” and the paper was waiting for a response from King over the allegations. The following day, Friday, Vaughan tweeted that King’s column was being suspended over the allegations and that the paper was still waiting for a response from the writer. King was then suspended while the Examiner investigated the claims. Once upon a time when I got behind the keyboard to write my column each week, the light burned strong. I knew what I wanted to write and how to write it. But then it began to flicker. Sometimes the words and ideas came; too often they didn’t. All i could think about were the things I knew I didn’t want to write about or share. I must apologise wholeheartedly if any material was unoriginal, if any research was insufficiently thorough, and if any attributions to other authors were insufficient. I have let the Irish Examiner and its readers down and I am very sorry for that. King said that while he could cite excuses including the death of his partner last year which he still finds “extremely difficult to accept”, ultimately “the buck stops with me”. The Examiner reports today that King said he was out of reach while visiting Ethiopia recently. An internal inquiry into the allegations involved a review of King’s columns for the paper. During this review, the paper says that some articles showed “lesser instances of misappropriated content, while others showed nothing untoward”. Editor Tim Vaughan said that “plagiarism is not tolerated” by the paper and that although there is no fool-proof system, random plagiarism checks will be made on the paper’s content “on an on-going basis”. Email “Irish Examiner columnist Steven King resigns following plagiarism controversy”. Feedback on “Irish Examiner columnist Steven King resigns following plagiarism controversy”.